You drive for show, but putt for dough. 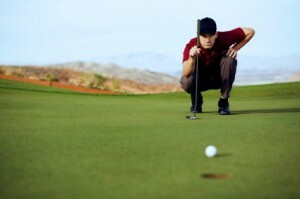 Do you know that you’ll never sink a putt if your ball is moving faster than 3.65 mph? How about if it is better to putt from above or below the hole? Watch this video from ESPN Sports Science desk to learn a bit more on the physics of putting. In the history of the sport, no style or position of putting has been left untried. Perhaps the only items left are the limits of technology. The purpose of this post is to instruct you how to putt like a surgeon. Not saying all surgeons are great putters, but most have a steady hands. Regardless of the technology, techniques, or form, putting is a highly individual art form. This post won’t claim one style of putting is superior than another. This post hopes to educate you on the styles, tips, and best practices that have yielded the highest results and then let you decide on how to putt best for you. We’ve already share how to hold the putter, but this one goes deeper. For example, let’s analyze some of the best putters in our sport’s history. Below are great images of how to putt like the best putters. Notice each one has their unique style they’ve cultivated from continual trial and error. 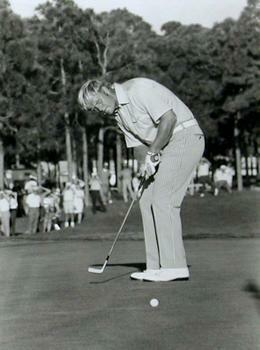 Jack Nicklaus had a very distinguishable style. Hunched over, knees bent, hands pressed forward, and an open stance characterized his style. If you’re wondering if changed over the years, take a look below. For those of you who follow our blog, one of our guest posters is Shawn Augustson, a student at the College of Golf and writes the blog Golf with Shawn and has shared with us some of his recent lessons. I made a little image so you can view this drill, it’s not to scale but gives you an idea of what I am talking about. Donna had me place a quarter on the green, and then I put my ball on top of the quarter (later on, I moved the quarter above the ball just as a reminder to look for it). The red lines in the diagram are for distance. So If I bring my club back two positions, I then need to take it forward five positions on the follow through. After impact with my ball I need to look for the quarter and hold the follow through position, not immediately look up for the ball. When I see the quarter, then I can turn my head slightly and use my eyes to watch the ball roll into the cup. To get my rhythm, I slightly hover the club (not ground it) behind the ball and count one. My backswing is a count of two and my forward swing is a three count. So when I putt, in my head I am “One, Two, Three”. Beginners will see marked improvements in their putting, and experienced golfers will recognize the important fundamentals in this lessons. We would expect everyone to benefit from putting it into practice. How do you compare to the best? MyScorecard’s You versus the Pros performance report offers you the ability to compare your skill against your favorite PGA and LPGA professional. But how good do you have to be to graduate from Q-School? We’ve run the numbers for the 2010 PGA and LPGA tour season in terms of 3 of the most often tracked statistics: Driving Distance, Greens in Regulation, and Putting. Averaging 315+ yards per drive, Robert Garrigus is far and away the longest driver on the PGA tour, with Bubba Watson leading the rest of the pack. But do you have to be a 300+ yard driver to be on the Men’s Tour? Not quite so. The vast majority of PGA tour players drive between 280 and 300 yards – but you’d better be at least 275 or longer if you want to play on the tour. MyScorecard members have a diverse array of experiences as well as stories and lessons that we can all learn from. One of our members, Shawn Augustson, is a student at the College of Golf and writes the blog Golf with Shawn. In this post he shares some of his most recent lessons. In order to improve your golf game and become a better player, it’s essential to have an updated strengths and weakness profile. Keyword being UPDATED… you will want to continually track your progress. If someone were to ask you how your game went and you replied with “It was alright. I hit my irons well, but the rest of my round was bad.” This would be an analog response. You want to be thinking DIGITALLY, and be more specific. This is what will help you improve. I will give you an example, I am a student at the College of Golf in Port Saint Luce, FL. In my swing fundamentals class with Dr. TJ Tomasi (Golf Magazine Top 100 teacher) we had to track the digital information from each of our rounds and be able to compare them to a tour player. When I would look at my putts and see that I was 2 putting across the board I thought I was bad at putting. As I began to track other statistics from each of my rounds I discovered that my putting was not the problem because my first putt was always from around 30 Feet! The problem was with my approach. I wasn’t getting to the green in regulation and when I was on the green I was barely there. According to Dave Pelz and the extensive research he has done, any putts from 15 feet and beyond your best case scenario is 1 in 10 for holing it, even for the tour player. How much does putting really matter? It does, but maybe not quite as you thought. Drawing on our database of millions of scores, we are able to pose and answer questions that bring you interesting insights. So we asked ourselves – how important is putting for your handicap? Some people think it’s quite important (how many of you own or have read Dave Pelz’s Putting Bible?). Others believe it makes no difference and don’t even bother hitting the practice green. I remember reading somewhere that the average golfer effectively lowers his or her handicap a full 3 strokes by taking unwarranted gimmes. In other words, taking gimmes on a regular basis results in a handicap index that is lower than your true ability. This is bad if you’re giving strokes to your friends on Saturday mornings. I don’t know how accurate that 3-stroke statistic is, but it’s compelled me to take the time, even when I’m just playing by myself, to putt everything out. I always want to know that my handicap is an accurate measure of my game, and unfortunately my game includes a fairly severe incompetence from inside 5 feet.